Figuring out how to effectively—and legally—manage your team’s personnel records is often a daunting task. But, developing a records retention schedule will ensure that you keep the documents you need and toss the ones you don’t. 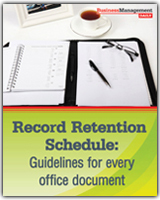 Business Management Daily is offering Record Retention Schedule: Guidelines for every office document FREE to help you establish an efficient records management system to inventory your documents, comply with the law—and avoid costly lawsuits. This resource will show you how long to keep records for operational, legal, fiscal and historical reasons, and when to destroy them because they’re no longer useful. Don’t be a “just in case” hoarder when it comes to your company’s records. Make sure you’re storing documents only for legal, operational or archival reasons, and retaining and destroying records systematically.